Dr Thomas Chen is based in Stockton, California. He has developed exciting and powerful software for the Creamware Pulsar system, providing multiple, configurable B-format and B+ format decoding, mixing and signal manipulation subsystems. He intends to make this software available commercially, either through Creamware or direct, in the near future. Here are some screen shots of his software. We will be providing further information as it becomes available. B+ Format Decoder. Thomas' "B+ format" consists of a stereo front stage overlaid on a B-Format Ambisonic decode. The B-format provides the sound of the room or environment, while the stereo signal, which leads the B-format by a few milliseconds, provides solid localization of direct sounds across the front stage. The stereo can be recorded by whatever means are appropriate. B+ could be recognized automatically, for example, by a flag in the MLP data stream on a DVD-A disc. For more on this technology, see Thomas Chen's papers, Beyond 5.1 (PDF) and Working with B+ Format (presented at Surround 2001). Note that Chen's "B+" is distinct from Gerzon and Barton's "BEF" (in which two additional channels, E and F, are integrated into the B-format signal for increased localization accuracy at the front along with compatibility with 5.1). The decoder is configurable to offer up to two stacked octagonal speaker rings for full Periphonic replay. 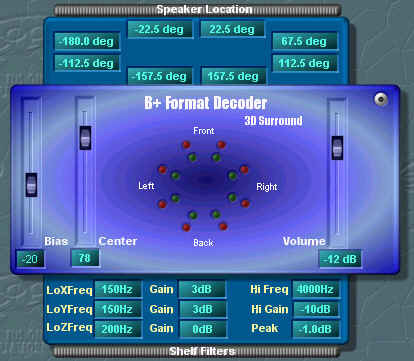 The angles of all the speakers can be set, along with the shelf filter gain and frequency. 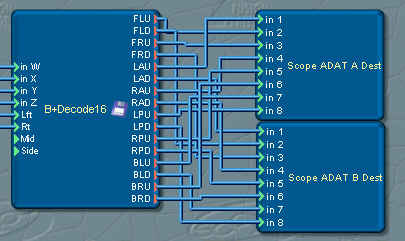 The patching system allows B+ Format to be decoded and routed to the desired destinations. Note that the B+ input includes not only full B-Format (WXYZ) but also both L-R and Mid-Side stereo inputs. 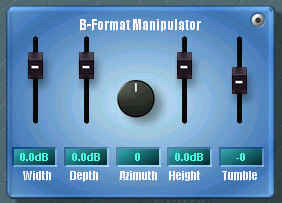 The B-Format Manipulator is essentially a multi-parameter B-Format panpot. It can be sourced by B-format signals and thus can manipulate one entire soundfield within another. The B-Format Mixer is a convenient way of handling multiple mono, stereo and B-Format signals and mixing them into B-Format. The mixer has all the usual features per channel, such as EQ and dynamics, but the localization is much more sophisticated. This closer view shows a typical input channel (set to stereo input, in this case) and the master B-Format output channel and metering. 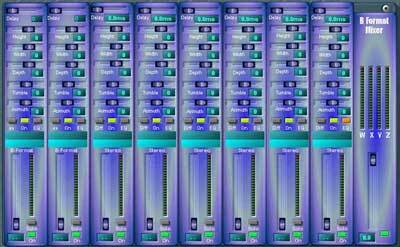 The two-tone blue panel above the channel fader is used to graphically set EQ parameters (it is currently set flat).